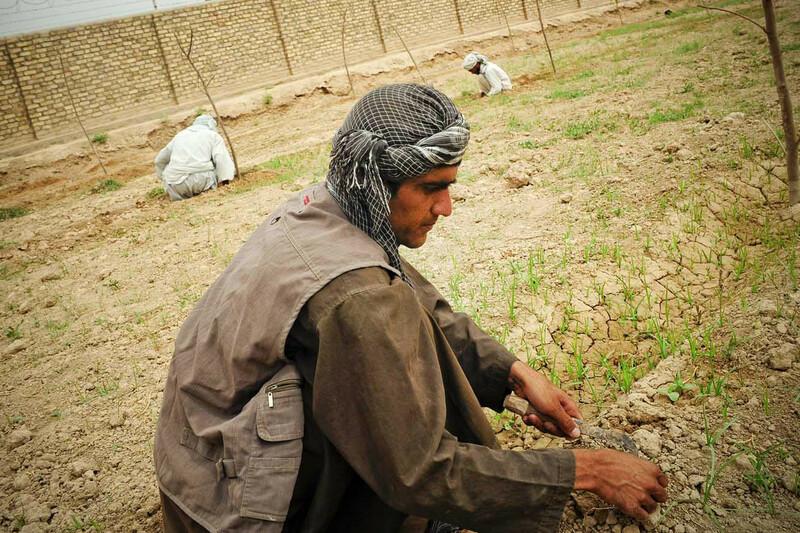 Approximately 80 percent of Afghanistan's residents livelihoods depend on some form of agricultural activity. From the total irrigated area of 3.2 million hectares (ha) only about 1.2 million hectare are used for agriculture purposes. The remaining 1.8 million hectare stay unutilizised due to lack of infrastructures and traditional practices of irrigation. The amount of available water should be enough to cover current and future uses, but is underutilized: Out of a total of 75 billion cubic meters (bcm) of available water, only 20 bcm are being used. In order to close this gap, better infrastructure, water management and farming practices are required. Substantial questions remain regarding whether Afghanistan can responsibly develop its agricultural, mineral and other resources. Already-identified problems are: an accelerated and unsustainable overuse of natural resources, obstacles in implementation of laws and policies, lack of public awareness and knowledge in understanding the long-term environmental impact of resources misuse, lack of capacities and strategic planning to overcome these challenges, dry climate, lack of sea access, and inadequate use of water for irrigation and electricity production. All of these factors are exacerbated by persistent brain-drain and an economy too weak to support large national level projects that overcome current and future challenges. In Afghanistan major areas of people concern include: agriculture/food, mining, forestry, biodiversity, power supply, waste management, people as a resource and a resource controller, air pollution, traffic with lack of safe public transport system, and land. Also we cannot ignore the role of women and children in development, gender discrimination, lack of accurate data, weak legal mechanisms and coordination at different levels for resource management, managing extractive industry, change in weather, rapid development, and education. According to the World Bank, 97 percent of Afghanistan's gross domestic product comes from foreign money, largely from aid groups and military provincial reconstruction teams. In the context of Afghanistan, conflict sensitivity methodologies were not properly employed and as result communities were not happy with the interventions of the state, as they lacked prior consultation, did not develop trust, and mutual benefits based interest was missing. Still, the majority of the communities is living below the poverty level, having no access to basic needs of life. By passage of time their living conditions are getting worse due to lack of government attention and foreign assistance based projects. Furthermore, developed policies are not implemented and new challenges are arising. This essay will proceed as follows: After brief introduction (Section 1), Section 2 will focus more on present problems, particularly with regard to agriculture, forestry, and water issues. In turn, Section 3 will address how these issues relate to Heinrich Böll Foundation and The Green Political Foundation resource memorandum priorities and vision. The paper will be concluded in Section 4. The government of Afghanistan focuses on mines as major future source for national income. Standard laws for mine extraction are developed, but the major challenge is the lack of capacities in the implementation of the laws and policies. The draft mining law was not approved by the cabinet, citing lack of capacities for implementation in the ministry and corruption prevention. Much work needs to be done on community empowerment, in order for the communities to have an active role in mineral extraction decision making and monitoring private sector activities in those areas. Every mining site's environmental impact has to be evaluated before any contract, in case the project has a negative environmental impact it has to be stopped and avoid proceeding work there even if it has high income for government. The mining industry should, as national priority, be based on public benefits and avoid corruption. We have to focus on research and development for alternative sources (hydro power, electricity production, improvement of irrigation system for agriculture), and the received income has to be used for sustainable development of other sectors. Increasing energy demands, medium hydro power dams, deforestation and migration of people and animals from their residency areas, industrialization and development impacts on habitat destruction, pollution and climate change all contribute to biodiversity loss. Excessive consumption of resources, wars for control of resources and economic development, especially the use of bombs, explosives, and chemicals in the environment, and experimentations of upgrading and enrichments of explosives materials can have disastrous environmental impacts. All these factors have negatively impacted biodiversity, while a lack of laws influence, and control these impacts compound existing concerns. Trade and hunting of animals and birds for food consumption purposes, entertainment, and development intervention is still on-going and no major impacts of the policies are seen so far. Unsustainable extraction of naturally and wildly growing medicinal plants by communities, not considering standard operation procedures in harvest and post harvest treatments of the medicinal plants has caused some species to become endangered, such as Licorice, Hing, Cuming, and other natural resources. Change of attitude and behaviour toward nature to overcome the challenges will be a key to having a sustainable clean and friendly environment. As for biodiversity, there is a strong need to focus on damage control. First, through identification of high damage areas, developing protection and preservation systems, and working on restoring and rehabilitation of the losses. Second, there is a need to focus on information and legislation based on participatory approaches, develop education, and create awareness programs for communities to understand the links between resources and livelihoods. Also, there is a need to work with people to value biodiversity and change their attitudes by learning, awareness, and collaboration with government and other societies. Inadequate clean energy for all, and the inability of the government to meet increased energy demands has contributed to an increased pressure on conventional energy (that includes oil, gas and coal), which adds to ecological damage. The missing structural framework of energy has resulted in a high cost of electrification. The existence of off-grid areas has contributed to degrading of resources, deforestation, and no, or very slow, economical growth and increase in burning of fossil fuels. To provide clean and sustainable energy it is recommended that production of energy from renewable sources of hydro power, solar, and wind be expanded. We need to focus more on research and development of renewable energy technology, continue impact assessments of the conventional and renewable energies, and develop policies in the way that government and private sector work together and support each other to achieve these goals. The decrease biodiversity impact should be decentralized and include participation to make sure that all stakeholders are consulted and consider ittheir own project. To decrease waste and use of electricity people have to develop energy saving plans by promoting use of efficient technology, and promoting efficient use of electricity through awareness and training. Also, there is a need to develop plans and policies for prevention of electricity distribution loss. The establishment of nuclear plants for energy production should not be allowed, as control and waste management are a big environmental issue. Several factors cause Afghan farmers to extract less value from their land than they otherwise might. These include wheat production deficit, low quality of seeds, increases in cost of agricultural farming/production (e.g. land preparation, irrigation, fertilizers, harvest and post harvest treatments and grinding), and market access. What is more, Afghan agricultural products, with a few exceptions such as dried fruit, cannot compete in the international market. Drought, desertification, and a low water table in many areas are other challenges that farmers are facing. Illegal cutting of forest accelerated for heating and construction purposes, and lack of application of forestry and agriculture laws and policies are major problems. Government access and control in rural areas to stop forest cutting and supporting people with alternative solutions of income to improve their life, such as forestry derived products, is lacking. The forest land and mountains have been distributed among resident communities, which is cut for personal use and sold and exported to neighboring countries and to Dubai, for use in construction and decoration. The resource distribution has caused many conflicts among the residents of forested areas and even between provinces, thereby increasing insecurity at the local, provincial, or even regional level (e.g. in southeastern Afghanistan or the Kunar border region). The cycle of deforestation and reforestation has become disconnected, from one side accelerated forest cutting and from other side weak reforestation (except some reforestation on private land as orchards and for construction purposes, poplar trees) has worsened the situation, and contributed to negative environmental impacts such as floods, damage of farm lands/houses, soil erosion, an increase in drought, and a decrease in the water table (also addressed in the next sub-section). The United Nations estimates that Afghanistan has a total irrigated area of 3.2 million hectares (ha). This amount of water should be enough to cover current and future uses, but is underutilized: out of a total of 75 billion cubic meters (bcm) of available water, only 20 bcm are being used. In order to close this gap, better infrastructure, water management and farming practices are required. However, currently, formal irrigation structures cover only 10 percent of the land in Afghanistan (332,000 ha), while informal structures (or no structures at all) cover the remaining 90 percent (surface water, ground water, small diversion structures, small-scale karez etc). Along the same lines, in the last two decades the water table in most regions of Afghanistan have been decreasing due to drought, extraction of ground water for irrigation and drinking, and lack of dams for water storage. This has allowed surface water flow to neighboring countries. Agriculture as base of Afghanistan economy can play a vital role, if the irrigation system of farm land improved, including rain-fed and desert land are brought under formal irrigation systems and hence cultivation. What is more, Afghanistan is a mountainous country and has a lot of opportunity for hydro dams due to slopes and fast flow of water. To be sure, hydro power dams can have negative impacts on biodiversity. However these negative effects should be compared with other environmental impact of the technologies used for substitute of hydro power. For example, hydro power lessens the need to burn fossil fuels, and can also decrease deforestation by offering alternative for heating and cooking, using wood or charcoal. Based on 2006 information from the Ministry of Power and Water (MPW), Afghanistan has a total hydropower potential of 25,000 MW, far more than Afghanistan's estimated power requirement of 2,642 MW. Currently, electricity consumption per head to meet the requirement is 400 KW per year. The current capacity is 304 MW, while near term capacity is estimated to be 800 MW. 9.7 percent of the required electricity is produced internally, from locally available resources of hydro, thermal, and diesel. 60 MW is imported, and the imported and locally produced electricity/energy meets 12.3 percent of the general demand for electricity. Even though large hydro power dams have had very negative social and environmental impacts in the region, they are not a pressing issue for Afghanistan. Typically, Afghan hydro power dams are of a small or medium size. This is due to Afghanistan's geographical location and the geologic structure of areas that have been dammed: dams have usually been built in mountainous areas, as opposed to flooding a larger plain. These conditions have mitigated much of the negative impact from the dams. Rather, the dams have tended to have a positive impact on biodiversity, the water table, and agricultural development. Afghanistan has about 55 billion cubic meters of unutilized water, and there is great potential of more than 2 million hectares of land that can be brought under irrigation to produce agricultural products. To close this gap, water storage dams need to be constructed, better formal irrigation infrastructure needs to be in place, water management improved, and training for farmers in farming practices provided. This will reduce the irrigation cost of farm land and farmers will not focus on illicit crops to gain more profit. For urban and rural areas, proposed medium dams will provide people sustainable and clean alternative energy sources, which will reduce dependency on fire wood for cooking and heating in fall and winter seasons. This will help in decreasing demand for firewood in many provinces, and also the government will be empowered in these areas and work together with communities on community based sustainable forest management. The increase in agriculture production by bringing more land under irrigation and improving irrigation system will also decrease food dependency of Afghanistan on regional countries and will even be able to export many agricultural goods to other countries. Also, people will have the capacity and knowledge of how to sustainably use their natural resources, instead of mass extraction they will sustainably extract less resources for value addition inside the country, change it to finish good or prepare it according to market demand for sale in regional and international markets to get higher profit. To overcome agriculture, forest, water, and hydro power needs and challenges, collaboration and coordination among the strategies and plans of Ministry of Agriculture, Irrigation, and Livestock (MAIL) and Ministry of Water and Power (MPW) will be vitally important for success. Because these issues are interlinked to each other, and if these components do not supporting each other jointly, by providing improved seeds for farmers for increasing yield, or drip irrigation techniques to decrease water use, and importing electricity from other countries to fulfill power/energy needs, improving traditional agriculture infrastructures to provide water for irrigation and clean water for drinking, will not be able to overcome these challenges. In sum, Afghanistan has significant resource needs. These needs cannot be fulfilled in the shortterm, primarily because of a lack of capacities and financial resources. These short-term priorities can be met with the review of our developed policies and strategies. It is important to point out primary activities that can be done with resources at hand as a baseline for medium and long term goals. This can start with a number of steps including: (1) awareness and training in forest management, (2) water management techniques for farmers and start impose of laws and policies, and (3) improved irrigation and reforestation with small scale infrastructure project that contribute to large projects. These can be started more or less immediately and are not capital-intensive. Meeting short-term priorities, of course, will be insufficient and therefore review of policies and prioritization of problems and challenges are required to effectively achieve medium and long-term goals. Medium-term priorities include improving irrigation systems and medium scale power projects and planning long-term implementation of large scale projects. Long-term priorities include construction of hydro-power medium level dams and national level water projects, along with large-scale reforestation. Dams, for instance, require significant amounts of money and time and, if not undertaken carefully, can have negative environmental impact. In addition to the national development fund, private sector and international donor agencies attraction is the key to the implementation of long-term priorities projects. In considering these short, medium and long-term priorities, it is also important to keep in mind several cross-cutting issues. First, to achieve setup goals commitment, financial support of the international community will be required. Second, capacity building of MAIL and MWP ministries staff is needed. Third, security measurements have to be taken into account for the implementation of the medium and larger scale projects particularly at the community level. By taking communities into confidence, mutual trust and relationship are established by continuous consultation and communication from the beginning of the projects. Communities should be informed about the benefits, impact, expected contributions toward country developments, and what benefits projects they will bring to targeted communities. Finally, because installing the third turbine at Kajaki dam has proven both expensive and impossible – constructing a new dam might pose even bigger challenges (e.g. Salma dam in Herat). This might suggest starting work in secure areas, while directing resources away from insecure ones – which is a reversal of current development priorities. Rainer Gonzalez Palau, "The Decision to Plant Poppies: Irrigation, Profits & Alternative Crops in Afghanistan" (Civil-Military Fusion Center, 2012).